Twitter has a troll problem that’s never going to go away, but its most recent tool is the smartest thing Twitter has done to help users deal with abuse. 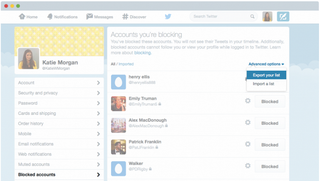 You can now share lists of users you’ve blocked with other people getting harassed. By allowing people to import and export their lists of blocked users, Twitter is giving them a way to block known trolls in bulk. Users who deal with abusive tweets can coordinate to help other users dealing with the same crap. Prior to this, Twitter users frustrated by the network’s lack of resources to stop trolls had to rely on third-party apps like BlockTogether. While this is one of the first genuinely useful changes Twitter has made to combat trolls, it still needs work. Instead of just importing and exporting, Twitter would better serve users by letting them work on collaborative block lists that could update in real time. Hopefully a more fleshed-out bulk blocking feature is in the works.